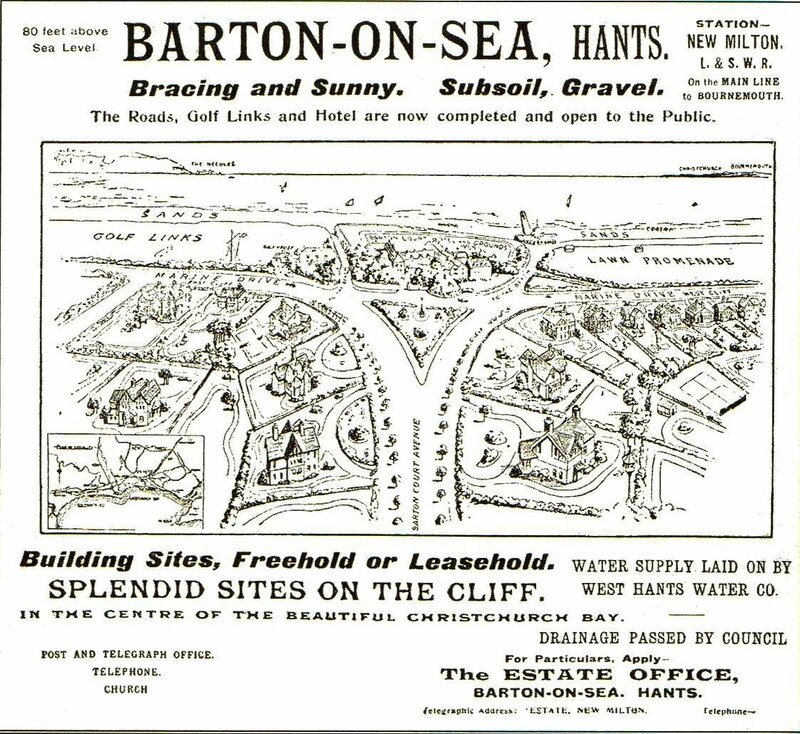 A Brief history of Barton-on-Sea. Barton-on-Sea has a great deal of history. It is probable that early man has hunted and fished here for thousands of years, as what we now think of as the cliffs and beaches, in an earlier age, formed the north bank of the ‘Solent River’. Consequently for many years it has been possible to find flints and fossils in the cliffs. 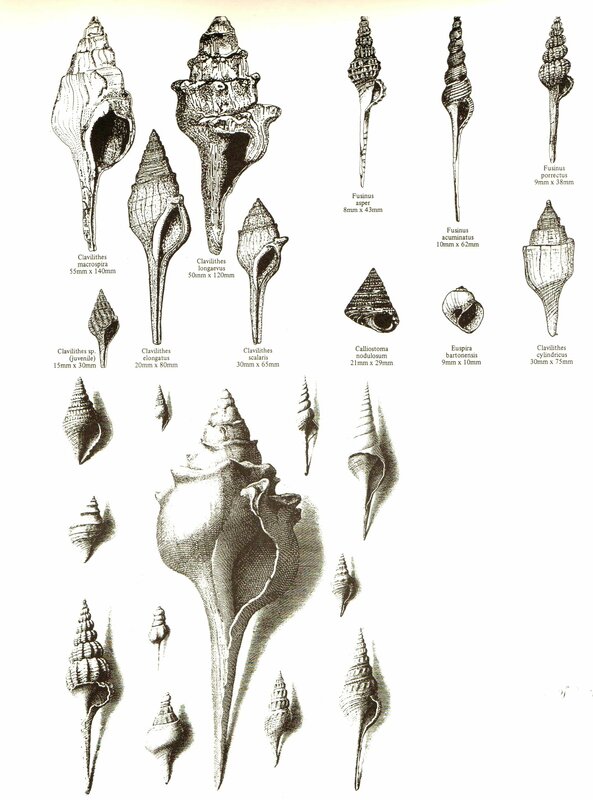 Some of these are now on display in the Red House Museum in Christchurch and in the Ashmolean Museum. Barton on Sea is the world type locality for the Barton Beds which is a series of grey and brown clays with layers of sand from the Upper Eocene age. This is roughly 40 million years old and the clay contains numerous specimens of fossils. Sadly in recent years the works to protect our cliffs from erosion has made it much harder to find specimens of these fossils in Barton’s cliffs. The name Barton derives from the age of the Jutes and Saxons. The ‘Ton’ part of the name indicates a farm settlement. The ‘Bar’ part is a shortening of ‘Beorma’. 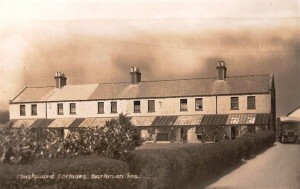 Thus Barton means ‘Beorma’s farm’. In the Domesday book it is recorded that ‘Bermintune’ or Burmintune was held by an old friend of William the Conqueror, namely Roger de Montgomery. In the north part of Barton, Moat Lane took its name from the moated enclosed area in the bend of the lane. It was at first thought that this was a Manorial farm, however excavations in 1956 by a Mrs Gill Hurst showed that it was a moated farm but containing various peasant structures. There is a similar site in Hertfordshire. It is thought that the moat was simply to protect the farm buildings and the livestock from attack by wild animals or perhaps as a fire defence. The whole area was fairly lawless as the inhabitants tried to survive the crushing poverty of the time. Many locals indulged in illicit poaching and became involved in smuggling. In 1823 the first coastguard premises was built on the cliff top. In 1868 a new coastguard station was built to house seven men and a chief officer, in an effort to stem the loss of revenue. It was recorded that in 1870 there were only 9 other cottages in Barton. 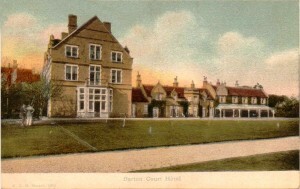 Barton Common was part of the Manor of Barton for hundreds of years. A common is a piece of ground that can be used by local residents. In times gone by this was to enable them to graze their cattle or horses on the land. The green tips of the gorse or Furze bushes would have been collected, chopped up and fed to their animals. This has a similar calorific value as oats. In addition the villagers harvested the thick woody parts of the gorse bush which burn very hot and are ideal for heating ovens. On Barton Common there was a gravel pit which was used by local residents and the council for road repairs. 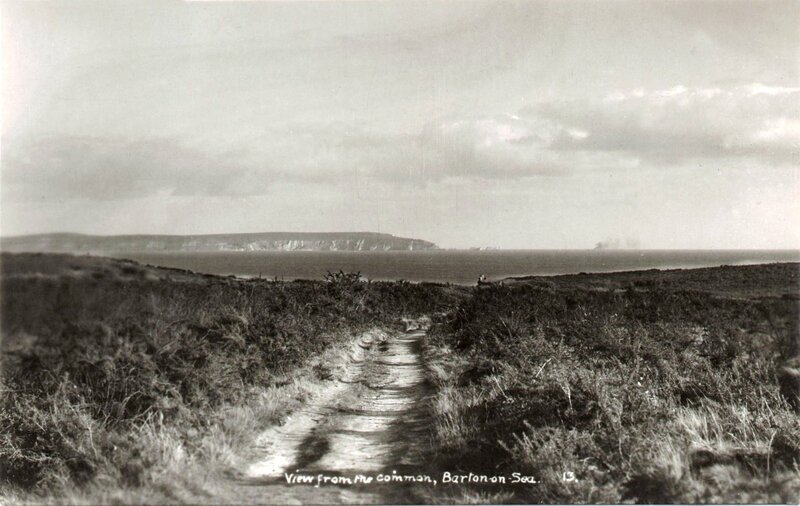 In 1903 a local solicitor Mr Alexander Paris, purchased Barton Common. He tried tried to prevent local people using the common tracks but a High Court action in 1911 decided in favour of the rights of local people. On Mr Paris’s death Barton Common was sold to the Lymington District Council and in 1970 it was formerly registered as Common Land under the Commons Registration Act 1965. With the passing of the Commons Act 2006 the rights of people to access and enjoy Barton Common is established in modern law. With the advent of the railway, and the first train services arriving at New Milton station in 1888, gentlemen and their ladies started to be attracted to the area. 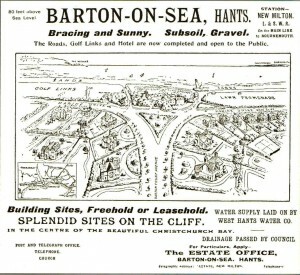 This artists drawing, for a 1904 estates agents brochure, was designed to show Barton at its best. 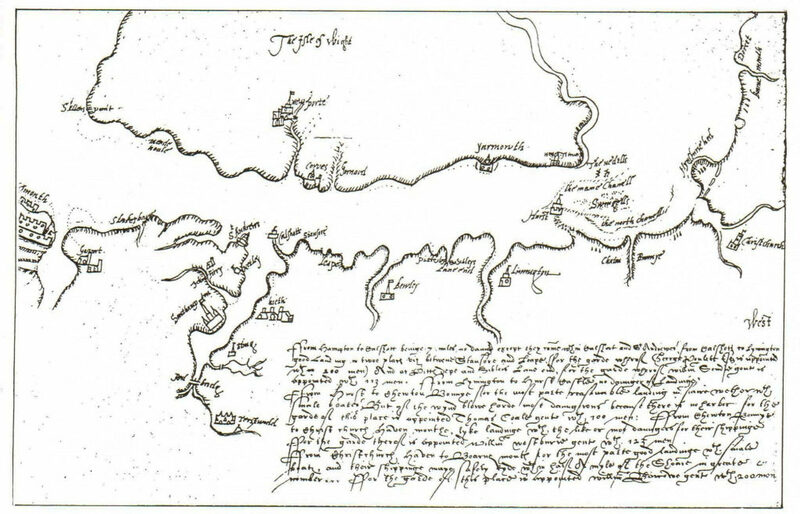 It depicted an area where land was easily available and services were already laid only. Magnificent houses were shown on a tree lined avenue, and ….there was a pier! This was possibly taking artistic licence a bit too far or perhaps there was a real aspiration to have a pier and promenade at Barton on Sea. 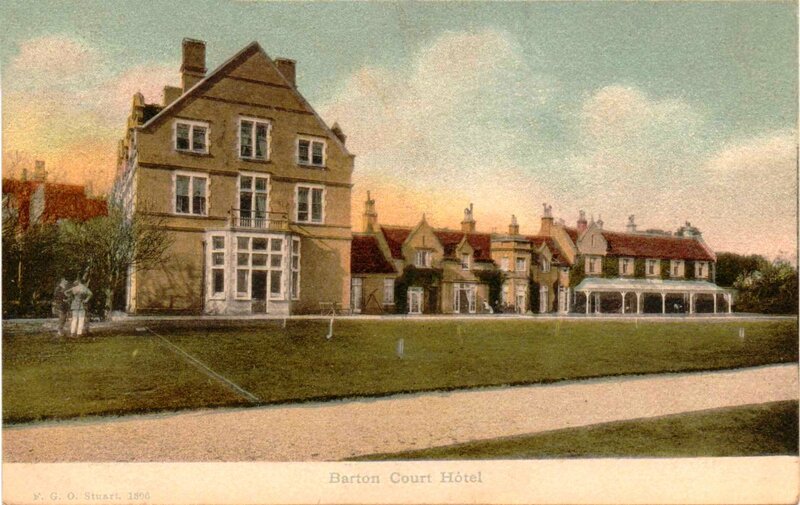 Top class accommodation was available at the Barton Court hotel, seen here in this 1907 dated postcard. The right or eastern wing of the hotel still exists but all of the land shown in front of the hotel has long since disappeared into the sea. In addition, a 9 hole golf course was available on the cliff front. This later became a full course in the 1930s. The art deco style club house was in use until the 1990s when the course and club house retreated inland to avoid an inevitable disaster with the eroding cliffs. recover from the effects of war. Although Barton on Sea and the town of Milton and New Milton have now grown into each other, the area of Barton still retains its own character with its wide avenues and magnificent houses and bungalows, and fantastic views out to sea. May the breezes of Barton blow forever!